Ah onions. I love onions. And soup. I love soup. Onion soup is a marriage of 2 of my favorite things. This onion soup is so so so good. 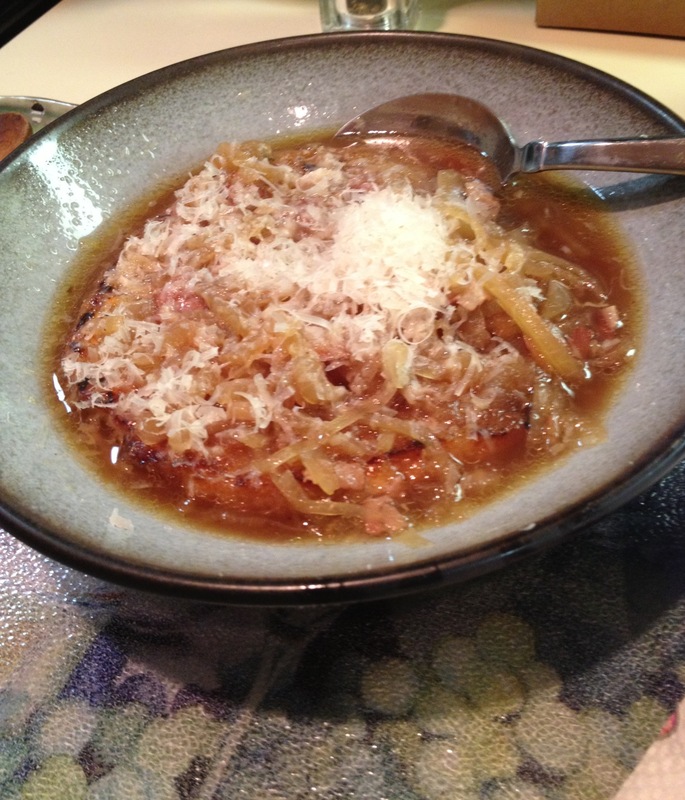 It’s similar to French Onion Soup but the addition of pancetta and parmesan (YUMMMYYYY!!!) give it that nice Tuscan flare and therefore, better than the French one. It’s so easy to make, it reheats well, freezes well and can be eaten for lunch, dinner, as an appetizer or whatever. So versatile. This recipe is a keeper!! If you look closely at the photo below you’ll see the broth, onions, parmsan cheese and just a bit of the crust of a garlic toasted bread that’s on the bottom of the bowl. Yes, really. In a large soup pot heat 4 tablespoons of the oil over medium high heat, add the pancetta and cook for 2 minutes. Stir in the onions, cover the pot and cook slowly for about 15 minutes, stirring often. When the onions are limp add the lemon juice and allow it to evaporate. Pour in the broth and wine. Stir the mixture. Cover the pot and simmer for 30 minutes. Add salt and pepper to taste. Keep the soup warm while you fry the bread. Heat the remaining olive oil in a sauté pan, add minced garlic and brown the bread on both sides. Place a slice in each of 4 individual soup bowls. Pour the soup over the bread and divide and sprinkle the cheese over the top. Adapted from Maryann Esposito via PBS Food. I really am loving having a slow cooker that works perfetly. After years of thinking they were all like that old one that I had (which wasn’t old really) that sucked I had pretty much sworn off of them. But not anymore! Heat the oil in a 12-inch nonstick skillet over medium heat until shimmering but not smoking. Add the onions, celery, carrots, garlic, cumin, pepper flakes, and 1/4 teaspoon salt and cook until the vegetables are softened and lightly browned, 10 to 15 minutes. Remove and discard the bay leaves. Remove the ham hocks and any portion of them that may ramin in the soup (there are fat pieces and small bones so be careful to remove everything-a spider works best), let cool and discard. Puree 2 cups of the soup with a stick blender until smooth, then stir back into the slow cooker. Season with salt and pepper and hot sauce to taste, and serve. Note: I added some Frank’s Hot Sauce in the last step as the soup needed a bit of a kick. It didn’t make it spicy-just gave it some heat. Add it a little at a time and stir and taste until you reach your desired heat level. 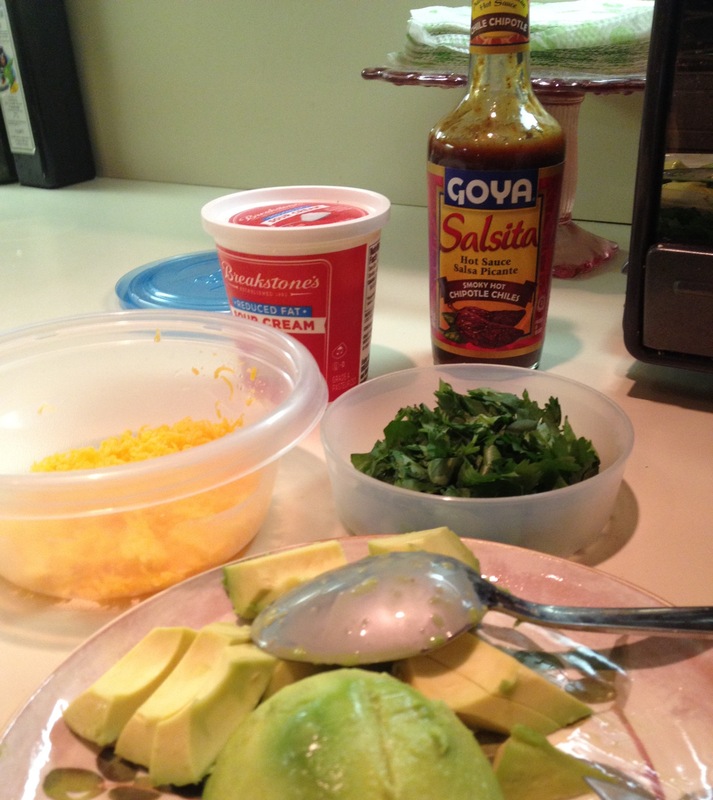 When serving I added a few squirts of my Goya Chipotle Sauce, a spoonful of sour cream and cilantro. The Chipotle Sauce gave it another dimension of taste without adding too much more heat. This soup also reheats well. Editors’ Choice Cookbook Collection. From The Best Make-Ahead Recipe. We found that unsoaked beans worked fine in our slow-cooker black bean soup recipe. It was well worth the time and effort to sauté the aromatics before adding them to the cooker; the black bean soup recipe that skipped this step tasted flat. As for flavor, we knew we wanted a robust smoked pork presence. We tested our way through porky ingredients like bacon, kielbasa, ham, and ham hocks before deciding that the latter contributed all the depth we wanted. 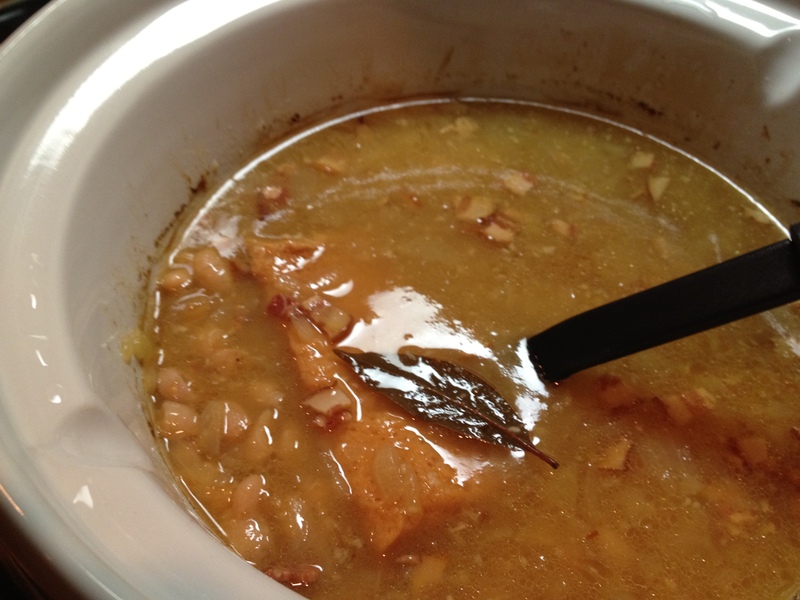 Once the soup was done—eight to 10 hours later—we stripped the meat from the hocks and stirred it into the beans. (I did not do this as basically everything was off of the bone-I removed the pices of the hock from the soup with my strainer and discarded them). 1. Cook the vegetables as described in step 1, then transfer to an airtight container and refrigerator. 2. Pick over and rinse the black beans and refrigerate. If the soup becomes too thick as it sits, thin to the desired consistency with either water or broth. Well, 10 days after hurricane Sandy a snowy nor’easter showed up. I was SO glad that I had prepped some of the ingredients for this soup days before and then put it in the slow cooker in the morning before I left for work. Having a delicious soup waiting for me after work on a dark snowy night was great. I like this recipe for many reasons. 1) it’s from Cook’s Illustrated so you know it will work 2) there aren’t really many ingredients 3) you can prep some of the ingredients days before and then throw it together in 5 minutes 4) it was really really tasty!!! Note: if you’re using dried beans you’ll have to soak them overnight. 1. Heat the oil in a 12-inch nonstick skillet over medium heat until shimmering but not smoking. Add the pancetta and cook until golden, about 10 minutes. Stir in the onions, garlic, and 1/4 teaspoon salt and cook until the onions are softened and lightly browned, 10 to 15 minutes. 3. Add the rosemary sprig, cover, and continue to cook until lightly fragrant, about 15 minutes longer. Remove and discard the bay leaves, rosemary, and Parmesan rind (if using). Season the soup with salt and pepper to taste, and serve, sprinkling individual portions with the Parmesan and olive oil (if desired). So the shortcut: cook up the onion and pancetta a few days beforehand (up to 3), put in an airtight container and put it in the fridge until you’re ready to make the soup. Years ago , I believe it was for my wedding shower (must’ve been 2005), I received a slow cooker. 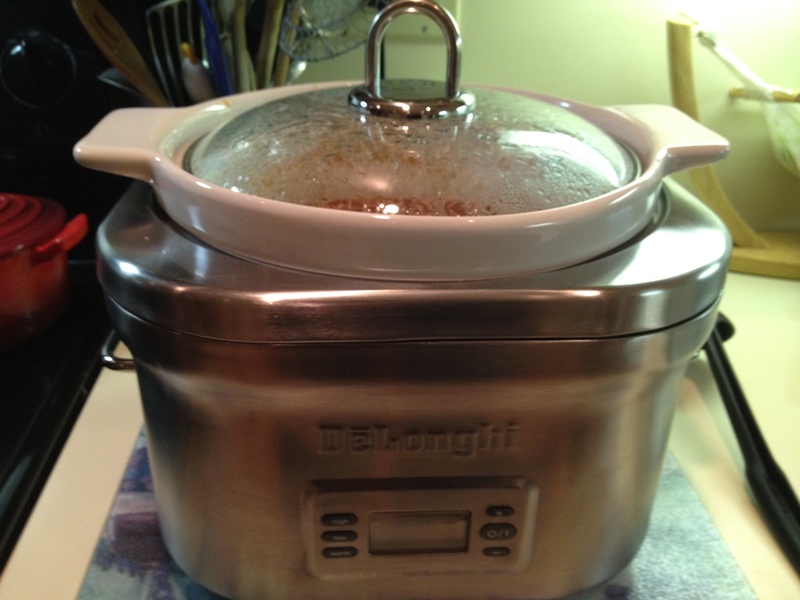 It was from our registry, a Cuisinart 6qt, and it was pretty and shiny. Unfortunately it had the same problems many others had with the same cooker(so I see on the Amazon reviews)-a rattling cover, steam sneaking out and running down the side of the insert into the holder and making the screws rusty. In other words-I didn’t trust it. I used it maybe twice. So recently I bought a new one–this gorgeous DeLonghi model from Amazon and I fired it up this weekend. It’s wonderful! It cooks evenly, it’s easy to clean and it’s gorgeous looking don’t you agree? I trolled the internet looking for reviews and this one consistently got the highest marks. No rattling, no steam coming out. Just works like it says it will. Here it is in action. I don’t have a lot of counter space but it still fits really well!! So anyway I wanted to use the new cooker and I looked all over for a good chicken soup recipe. As always, Gina at SkinnyTaste, came through. This is my adaptation of her recipe. It was delicious!! You can make it spicy or not, up or lower the veggies and beans or use different beans. It’s very versatile. I had a variety of fixings on the side to top it too-tortilla chips, sour cream, shredded cheddar cheese, cilantro, avocado and chipotle sauce too. Note: the Salsita, chipotle powder and chili powder are all to individual taste in the recipe below. 2 tbsp Salsita (chipotle hot sauce). Goya makes it. Or you can use 1 chipotle in adobo-but be careful-they’re hot. I found the Salsita gave a bit more control with the heat. Heat oil in a saucepan over medium-low heat. Add onion and garlic and sauté until soft, 3-4 minutes. Slowly add the chicken broth, tomato sauce and Salsita and bring to a boil. Add cilantro and remove from heat. 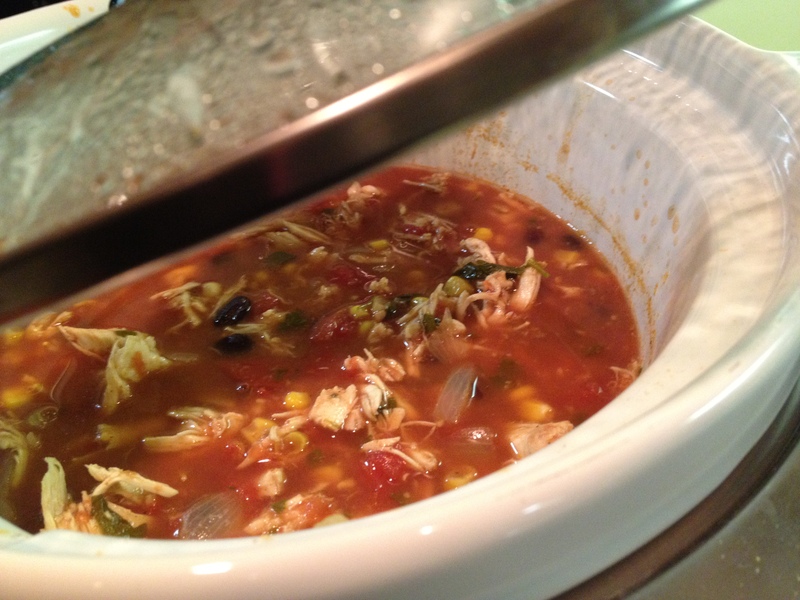 Pour into crock pot. To the slow cooker add drained beans, diced tomatoes, corn, cumin, oregano and stir. Add the chicken breasts; cover and cook on low heat for 4 hours. Remove chicken and shred with two forks. Add chicken back into the soup, adjust salt, cumin, chili powder, chipotle powder and Salsita to taste. Serve in bowls and top as desired. 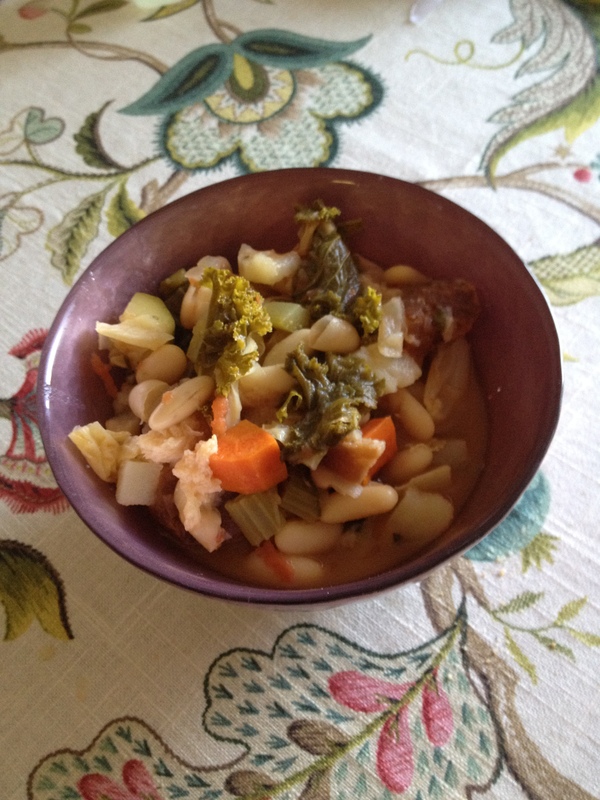 Ribollita a/k/a memory of Florence in a bowl. I have an obsession with Florence. A serious one. 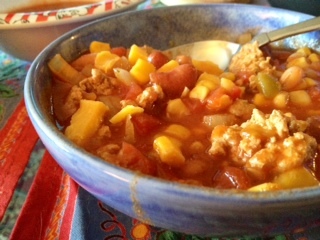 Now that the weather is starting to get cooler I couldn’t wait to make this thick, delicious, healthy soup. It reminds me of the last time I visited Florence which was in February of this year. The winter is a great time to go, by the way, as it’s absolutely empty! Anyway this was the 2nd time that I dined at Antico Fattore (the first time was in Sept. 2010). They serve this soup there and I can’t get enough of it. This recipe is pretty close to what I get there but, as always, there’s something missing. Perhaps the ambiance of Florence. Perhaps a secret ingredient that the restaurant throws in. Who knows. But having a bowl of this brings me right back to the inside of a small and cozy restaurant on a small street on a cold night in the most enchanting city on earth. Enjoy!! 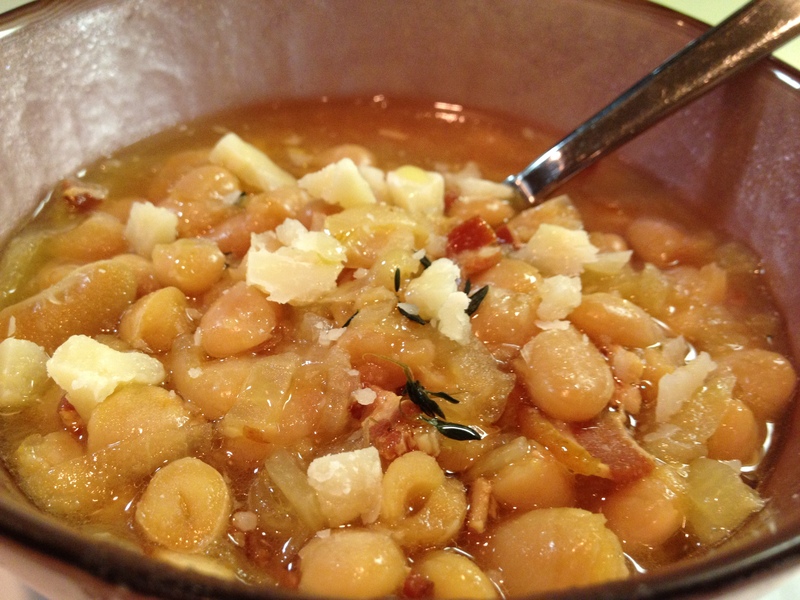 Notes: if you’re using dried beans you’ll need to give yourself 3 days to make this. If you’re using canned, 2 days. In a soup pot over medium heat, warm the 1/2 cup of olive oil. Add the carrots, celery, onion, potatoes and zucchini and saute until the vegetables are softened-about 10 to 15 minutes. Stir in the tomatoes and 4 cups (32 fl oz/1 l) water then add cavolo nero (or kale), savoy cabbage and spinach. Raise the heat to high, bring to a simmer, reduce the heat to low and let cook until the greens are tender-about 45 minutes. Stir in the beans and cook over medium heat for 10 minutes longer. Add the thyme leaves and season to taste with salt and pepper. Remove from the heat and let cool, cover and refrigerate overnight. The following day, preheat the oven to 350f. Line a 2qt (2l) baking dish with the toasted bread and ladle the soup over the top. Bake, stirring occasionally with a wooden spoon so that the bread slices break apart and blend with the soup, 20-25 minutes. 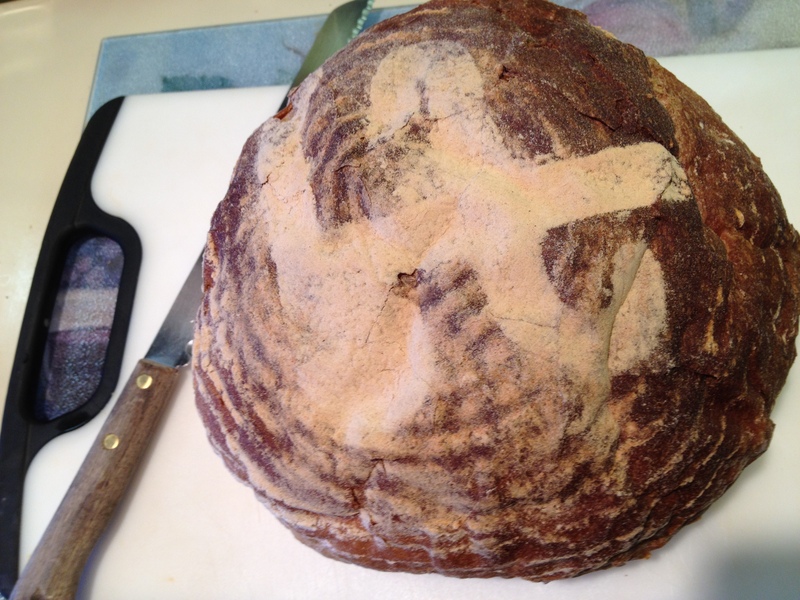 Continue baking without stirring until a lightly browned crust forms on the top of the soup-about 5-10 minutes. Serve at the table directly from the dish. Season generously with olive oil and pepper. Makes 6-8 servings. Serve with a nice Chianti!! 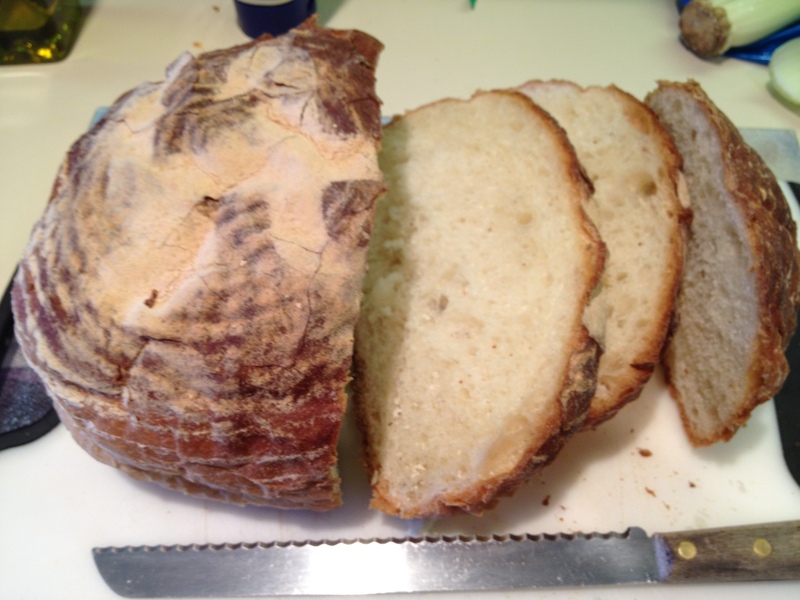 I bought this gorgeous loaf of the house bread from my local Fairway and it was perfect for this!